Individually and collectively, we are all dancing with an ever winding and widening path of evolutionary change. So much of this transformation leads from our individual, egoic identities into more a unified consciousness, honoring the interconnected relationship between ourselves and all of life. Here is one story of remembering this interconnection that I've been experiencing over the last few years that feels in line with these times now. My prayer in sharing stories is always to empower and encourage all of us who feel the call to honor our truth and follow the path that resonates with our embodied souls through the blessings and challenges of time. In 2016, we began working on an online course to support my book Qoya: A Compass for Navigating An Embodied Life that is Wise, Wild and Free, drawing inspiration from the phases and cycles of women's bodies to create life through menstruation and pregnancy to support the women in our community who repeatedly said, "I feel this call to create!" For some, the call was a business, or others creating their home as a sanctuary. For some it was a creative project, and for others, like me, it was also a prayer to manifest my desire to become a mother. In 2017, I experienced a miscarriage. 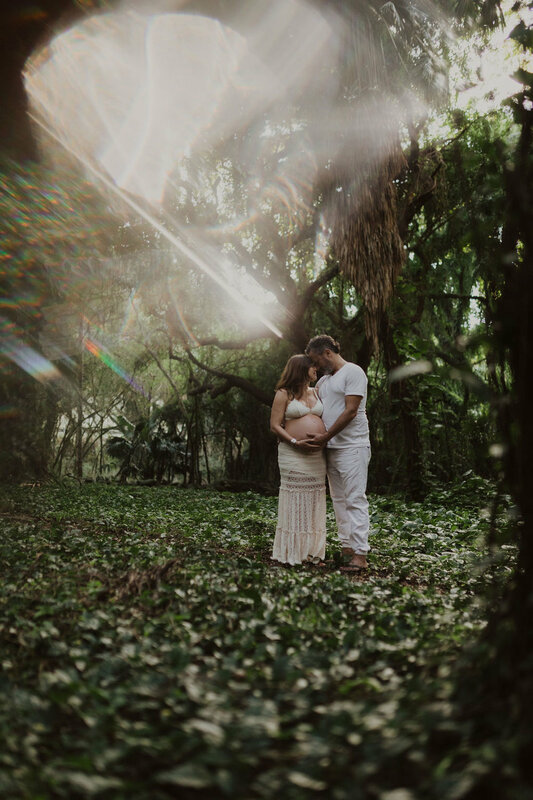 Fortunately, from being both a participant and invitation maker in women’s circles for over 10 years, I knew this was common, and I was able to optimistically embrace the idea that a miscarriage can be a way that the body prepares for a healthy pregnancy. Unfortunately, I was medically misdiagnosed with a rare condition that I was unnecessarily treated for for almost six months. Fortunately, this led me to go deep into my body, mind, heart, and soul for a time of deep rest, re-emerging with a commitment to honor the interconnection of all living things, mothering myself, the land, community, and each moment the same way I desired to embody the role of mother as a parent. In 2018, I showed up to teach at the annual Collective Retreat with the theme of A Call to Create. I shared my journey above and offered the medicine I had received, which was about resting and nourishment as part of the path to creation, but more specifically about resting into one's own essence. As you can imagine, there were many twists and turns along this winding road. 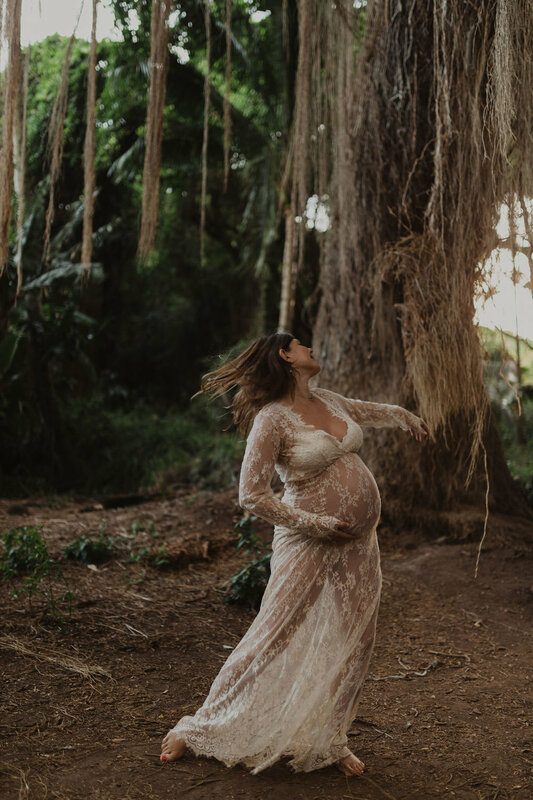 This year in 2019, I will be at the 10-year anniversary of Qoya at the Collective Retreat in Costa Rica in spirit, but I will not be there in body because...I am expecting a baby boy at the very same time. The experience of feeling a call to create and of embracing challenges as teachings and pathways to empowerment and humble understanding has been a rich rebirth of myself running concurrently with the preparation to birth a being into this world. I feel so grateful for the Qoya Collective Teachers co-facilitating in Costa Rica who have devoted so much of their path to holding space for trusting the ever winding path of evolutionary change for the people in their personal communities and the larger Qoya community during this retreat. This week, I'll be leading my last retreat before the baby is due on the Big Island of Hawaii with author and activist, Elizabeth Jenkins, on her family farm where we will dance, pray, sit in ceremony, and live into the prayer of remembering our true nature as we go on the inner and outer adventures through the wise, wild, and free nature of this sacred land. Ten percent of the retreat cost will be donated to a Women's Heath Center that serves the Q'ero Women in Peru, whose teachings have been a deep inspiration for Qoya and our collective path of remembering. As I think about this winding road of change that we all experience in our unique ways, I think of the Taoist story of an old farmer who had worked his crops for many years. One day his horse ran away. Upon hearing the news, his neighbors came to visit. "Such bad luck," they said sympathetically. "Maybe," the farmer replied. The next morning the horse returned, bringing with it three other wild horses. "How wonderful!" the neighbors exclaimed. "Maybe," replied the old man. The following day, his son tried to ride one of the untamed horses, was thrown, and broke his leg. The neighbors again came to offer their sympathy for his misfortune. "Maybe," answered the farmer. The day after, military officials came to the village to draft young men into the army. Seeing that the son's leg was broken, they passed him by. The neighbors congratulated the farmer on how well things had turned out. "Maybe," said the farmer. As you dance with the present moment, a result of the changes of the past and a beginning of the changes to come, I offer our Qoya community of practices, movements, rituals, and pilgrimages to encourage you to gift yourself the luxury of time to create moments of embodied presence and feel where the winding path of evolutionary change is leading you. My prayer is that it supports you to trust that path. The Full Moon in Leo on January 21, 2019 (12:17am EST) is a Total Lunar Eclipse. Energies are heightened and hectic in an atmosphere of change. Emotions can be volatile as the body sings electric. This Moon feels like a wild ride, bringing twists, turns, and unexpected happenings. Turn on your antennae, sense the nonsensical, and increase your abilities of adaptation. We are rapidly-evolving beings - each novel thing we become conscious with changes our range of ability and perception. Everything is co-created. Eclipses are revelatory. This one offers a breakthrough. The changes that arise now are revealing the previously inaccessible and shaking us awake. We are kindling. Food for a fire belonging to spirit. Embrace the activation, however abrupt it may feel. The first three weeks of the year have asked us to be purposeful in our pursuits. It’s been less about what we desire and more about what we’re destined for. Aligning with our life’s work can feel big, affirming, and also like a special kind of burden. We’ve contacted the barriers, blockages, and bad habits that keep us from meeting our goals. We’ve looked back through the timelines and summoned our inner authority. Now, overthrow that authority and any hierarchy within. Locate yourself in the collective, co-occurring network of beings. Disrupt the past and find interdependence. Linear time is an illusion. This Moon minds us that the path is never just straight and narrow. All versions of us are available for access. Choose what version of you to dial into. Rather than overcoming the old or battling with what keeps us confined, be in total creation of the new. Grab onto your gifts and go, with gusto. Contact pure truth and let it lead you. Chaos is freeing. Everything is fractal. Humans are divine. What are you creating, and who is it for? How do you act as an agent of change? Simple. Live your gifts and connect. The most common gift of Qoya is increasing your ability to notice how you feel through movement. Another invitation with this full moon is to notice how you feel by deeply nourishing yourself with herbs. One of the biggest allies on my fertility path was enrolling in herbalism school with The Gaia School of Healing and tending my first food garden where my husband and I planted seeds and grew our own food. I can honestly say before these two things, I don't think I had ever really understood what the word "nourishment" could feel like when embodied. My intention this year is to share some of those offerings with you for those who feel the call to deeply nourish yourself in this way. My first invitation is to make yourself a Burdock Infusion! Step One: Get some burdock root! This is available at a health food store or Mountain Rose Herbs. Step Two: Take a tablespoon or two and put in a mason jar with fresh drinking water. Let it sit 4 - 8 hours. Step Three: Drink to taste. If it feels strong, water it down until it feels like you could drink a whole jar no problem. Step Four: Notice how you feel as you do this every day for one, two, three, or four weeks. Drinking burdock root daily was a catalyst for one of the most grounding, stabilizing, and healing experiences I've ever had. This medicine is strong in its subtlety and also not a quick fix of drinking it one time, but of daily integration with your true intentions. In the midst of so much change, I wish for you to find the practices that keep you the most optimally connected to your body, soul, others, the earth, and spirit. Maybe burdock root will become one of them! For additional benefits, you can also consult Google :) However, I recommend learning from the plant through your own experience of it as much as you feel comfortable. Thank you for the courage of your soul to live this embodied path on the ever winding road of evolutionary change. May it be blessed! Come celebrate the 10-year anniversary of Qoya this March 23 - 30 at Qoya Collective Retreat in Costa Rica. This year, we'll be exploring CONNECTION - to other people, to nature and the world around you, to spirit, and most of all, connection to yourself and to the sensations in your body. Only a few spots remain and payment plans are still available through January 21st, so if you feel the call to join us, please click here to read more and register. To continue diving into the energy of this Leo moon, you may also be inspired to check out the Embodied Astrology: Leocourse which includes an introductory video to give you an overview of Leo's aspects, a Qoya Movement Ritual so you can embody your own personal relationship to Leo, an integration video with an exercise to apply in your life, worksheets with journal prompts, and a blessing for deep reflection. We've added another Qoya Teacher Training Intensive with Rochelle Schieck November 18 - 24 2019 at one of our favorite spots, the Menla Mountain Retreat Center in upstate New York. There are many Initiation training options to prepare, including an online option, so if becoming a Certified Qoya Teacher is one of your 2019 desires, there's never been a better time to commit.